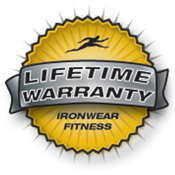 Flex-metal™ Additional Weight includes 1 patented IRONWEAR ™ Flex-metal™ weight insert. These unique weights flex and move with you when you exercise. They are as soft as your own skin and act as padding to protect you in case of a fall. Flex-metal™ weights are the most comfortable and safest weights available.